As many of you know, I recently returned from a trip to Piedmont, Italy. The fantastic food and wine of the region has inspired me so I’ve been working on my own interpretation of recipes that reflect the foods of the region using ingredients that are accessible to North American cooks. A popular dish in the Piedmont region is Brasato al Barolo, which is beef braised in Barolo wine. Unfortunately, Barolos can be quite expensive so you can easily substitute any inexpensive dry red wine, as long as it’s decent enough to drink. I used a bottle of Cantina Terre del Barolo Barbera d’Alba 2008, which retails for $13.95 in Ontario. Luckily, the recipe only calls for two cups so you’ll have the rest of the bottle to enjoy with dinner! I call for short ribs because they braise beautifully, resulting in a tender and flavourful dish. To build flavour and add umami to the dish, I’ve used porcini powder. Porcini are mushrooms that grow abundantly in Italy and are common in many Italian dishes. Unfortunately, fresh porcini are often difficult to find in North American stores because they are very perishable. However, many stores sell packages of dried porcini (I’ve seen them at gourmet stores, Italian specialty shops, some supermarkets and fruit and vegetable markets). 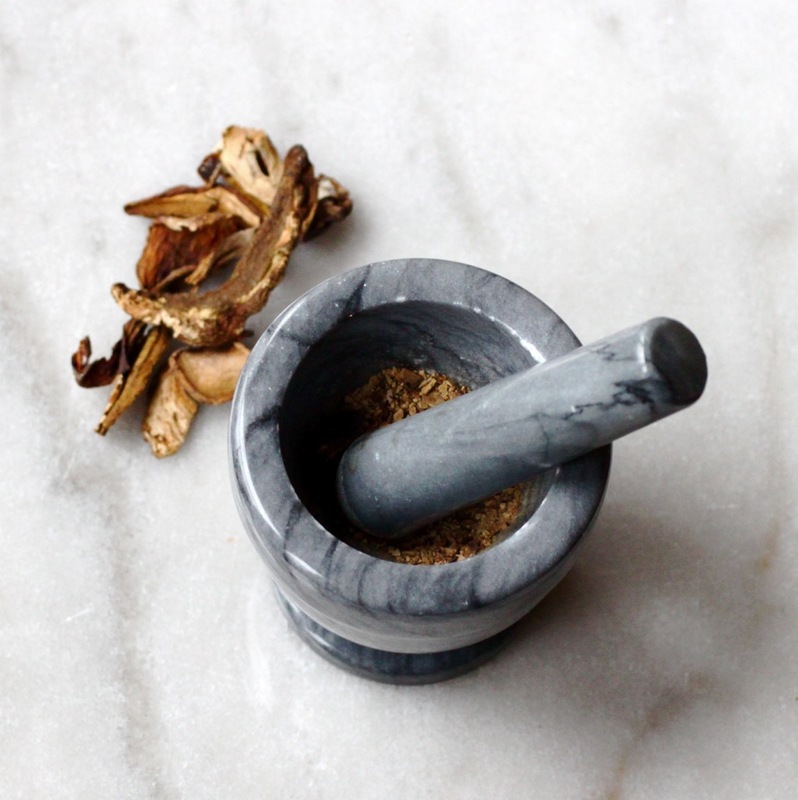 It’s very easy to make porcini powder from dried mushrooms: just add a few to a mortar and use the pestle to grind them to a powder (if you don’t have a mortar-and-pestle, just crush them with a rolling pin or the flat side of a large knife). Extra powder can be kept in a sealed container and used in soups, stews or pasta sauces. A Note About Authenticity: Italians typically serve Brasato al Barolo with polenta instead of pasta (pasta is usually served as a separate first course). However, egg noodles are delicious with the sauce, creating a rich and hearty main dish. Look for long, flat noodles made with eggs. The beef will taste even better after a day or two so plan ahead and make extras! Leftover shredded meat also makes a great filling for ravioli or agnolotti. Pat the short ribs dry with clean paper towels. Sprinkle with salt and fresh ground pepper. In an enameled cast iron pot (5.5 quarts or larger) or oven proof pot with a lid, add the olive oil and heat on medium-high. Add the short ribs. Let the ribs brown, about three to four minutes per side. Turn the ribs so that all sides brown. Remove from the pot and set aside. Add the bacon to the pot and sauté until it’s beginning to crisp. Add the onion, carrot, celery and garlic and cook until tender, stirring occasionally, about five minutes. Stir in the tomato paste. Add the flour and cook for two minutes, stirring constantly so it doesn’t burn on the bottom of the pan. Pour in the wine, beef broth and coffee. Add the herbs and the porcini powder, stirring to combine. Return the browned short ribs to the pot. Bring the sauce to a gentle simmer and place the lid on the pot. Put the pot into a preheated oven (350F). Cook for two hours. Check on the ribs after two hours. Stir to ensure nothing is sticking to the bottom. Return to the oven for another 30 minutes. Check on them again after 30 minutes – the ribs should be getting very tender and almost falling off the bone. Spoon some liquid over them (you can add another 1/2 cup of stock if the sauce is getting low). Return to the oven for another 20 to 30 minutes or until they are fork-tender and falling off the bone. Remove the pot from the oven. Use tongs to extract the ribs from the sauce. Place them in a bowl and set aside. Strain the sauce into a large sauce pan, using a large spoon to press all of the liquid through a strainer. Heat the sauce on medium-low heat. Spoon off as much fat from the top of the sauce as possible (you can also cool the sauce overnight – the fat will harden and can easily be removed). Place the cooked ribs on a cutting board. Remove any bones, fat and connective tissues and discard. Use two fork to shred the meat. Chop the meat into bite sized pieces and return the meat to the pot of simmering sauce. Season to taste with salt and pepper and heat through while preparing the pasta. 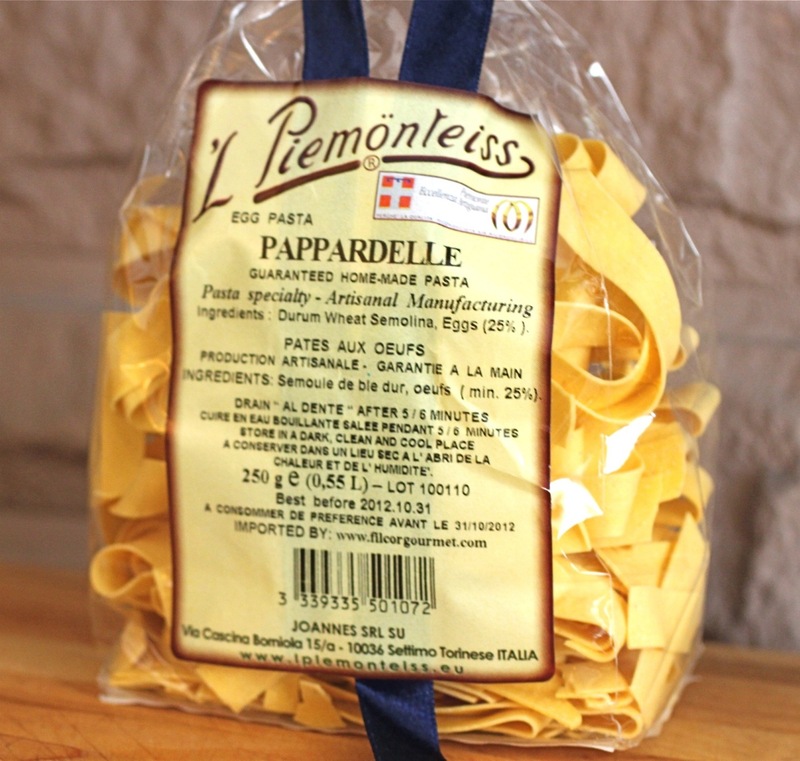 Cook the pappardelle or other egg noodles according to package directions (usually about 6 minutes). Drain well. 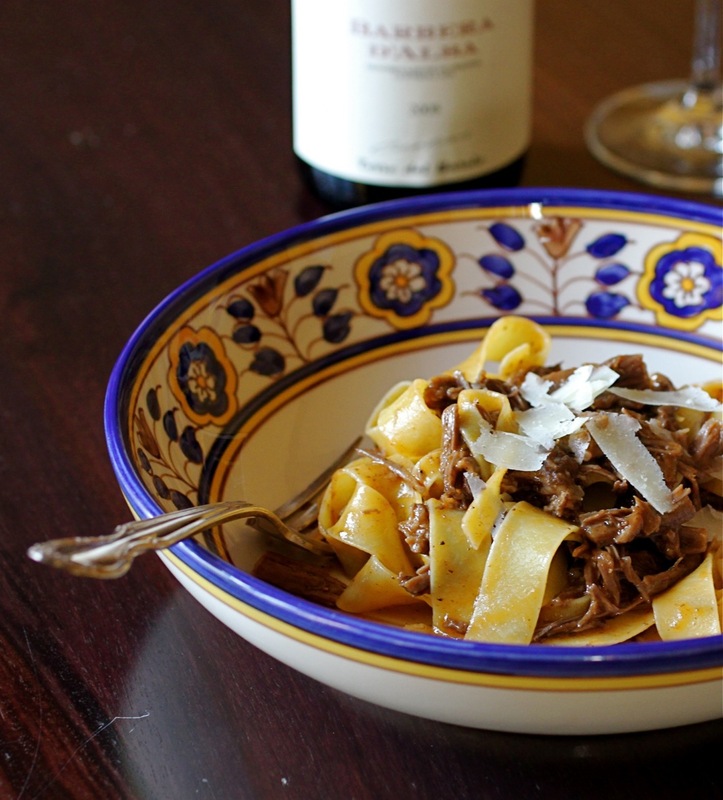 Toss the pasta with the braised meat and sauce and top with shaved parmesan cheese before serving.